Here’s a report that’s been sitting in my “to post” file way too long. SeaChoice looked at audits of 257 salmon farms between 2014 and 2018 to see whether the farms met standards of the Aquaculture Stewardship Council. To be certified, farms must meet 100% of the standards. Some did, but most did not. The results? Farmed salmon raise many environmental issues. If these data are correct, the Aquaculture Stewardship Council needs to do a much more rigorous job—and be much more critical—of salmon farms seeking certification. Tomorrow: what’s happening with GMO salmon. Seafood fraud, long a problem (I wrote about it in What to Eat), is still a problem. The latest evidence comes from a report from the New York State Attorney General. Investigators tested fish and found widespread mislabeling of just about every type of fish except striped bass. Mislabeling was worse at some supermarkets more than others; for example, five chains had mislabeling rates of 50% or higher. 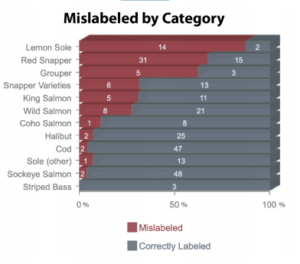 Some fish are mislabeled more than others, especially lemon sole, red snapper, and grouper. Substitutes were cheaper, less desirable fish, sometimes with higher levels of mercury. Mislabeling was common throughout the state, but the mislabeling rate for New York City was nearly 43%. If ever there was a call for caveat emptor, this is it. What to do? Ask. Complain. Demand regulation. Paul Greenberg. The Omega Principle: Seafood and the Quest for a Long Life and a Healthier Planet. Penguin Press, 2018. This is the third installment of Paul Greenberg’s fish trilogy (the previous two are Four Fish and American Catch, both also well worth the read). This one sounds like a book about nutrition—a nutrient—but it’s not. It may have started out that way, as a book about omega-3 fatty acids whose principal dietary source is fish, but Greenberg soon figured out that claims for the miraculous health benefits of omega-3s don’t hold up to scrutiny. Instead, he uses omega-3s as an organizing framework for discussing how we use and misuse fish for industrial purposes. To do this, he travels. He goes to the Mediterranean to examine what happens to anchovies, Peru to see what happens to anchoveta, to the Antarctic to see what happens to krill. His point? If we destroy the bottom of the seafood chain to make fishmeal or fertilizer, we destroy the ecology of fish higher up on the food chain. Greenberg is a lively, entertaining writer who tells great fish tales in pursuit of a serious message: if we want food in our future, we need to eat lower on the food chain. Should pregnant women eat fish? Yes, say FDA and EPA. The two agencies have just issued advice to pregnant women about eating fish. Fatty fish have long-chain omega-3 fatty acids which are good for health. But some have methylmercury, which is toxic to the developing fetus. And all have PCBs or other organic compounds that are unlikely to promote health. That’s fine, but which fish are low in methylmercury? Choices to avoid include, among others, Bigeye Tuna and Tilefish from the Gulf of Mexico. Good choices include Albacore and Yellowfin Tuna and Tilefish from the Atlantic Ocean. Good luck telling the difference. As I’ve written before (and also see this post and this one about fish politics), if you want to avoid methylmercury during pregnancy, it’s best to avoid tuna. Consumer Reports advises pregnant women not to eat tuna at all. The best advice for pregnant or nursing women and parents of small children is to choose fish that are low in mercury and high in omega-3 fatty acids, like salmon and sardines. They should avoid albacore tuna altogether, and consume tuna labeled as ‘light tuna’ very sparingly — no more than two ounces per week for women and one ounce per week for kids. And are PCBs a non-issue? Could fish politics have anything to do with this? The Senate just voted to reverse a decision of Congress last year to remove catfish inspection from the FDA (which is usually in charge of regulating seafood) and give it to the USDA (which usually regulates meat and poultry). Why did the 2008 and 2012 farm bills say that catfish inspection should be given to USDA? Defenders say it’s because USDA has the resources to protect us against unsafe Vietnamese catfish. Critics said it’s to protect the Mississippi catfish industry against the food safety hazards of cheap imported catfish from Vietnam. Indeed, the USDA inspection program is finding antibiotics and other unapproved carcinogens in catfish imported from Vietnam. This issue, however, is a sticking point in US negotiations with Vietnam over the Trans Pacific Partnership trade agreement. Vietnam wants the USDA catfish inspection removed as an unfair barrier to trade. What is this about? Not fish safety, really. It’s about protecting catfish farmers in the South and setting up “more rigorous” safety criteria that will exclude competitive foreign catfish imports, especially from Vietnam. Food retailers and retail trade associations are for reverting inspection to FDA. They say USDA’s catfish inspection program will take years to allow imports from Vietnam, thereby causing the cost of domestic catfish to rise. It’s not surprising if USDA’s import safety system is better than the FDA’s. USDA gets $14 million a year to run its currently non-operating catfish inspection system. The FDA gets $700,000 and, according to the Government Accountability Office, has managed pretty well with it. If the political fuss over catfish inspection reveals anything, it is why we so badly need a single food safety agency—one that combines and integrates the food safety functions of USDA and FDA—to ensure the safety of the American food supply. Detente between producers of GMO and labeling advocates: USDA Secretary Tom Vilsack held a meeting to attempt to forge some kind of accord between producers of GMO foods and advocates for GMO labels. By all reports, it didn’t work. Earlier, Vilsack tried to negotiate detente between GMO producers and producers of organic foods. That didn’t work either. GMO Salmon: The FDA says it will not allow imports of GMO salmon. Since GMO salmon are produced in Canada and Panama, this action in effect bans GMO salmon from the US food supply. The FDA is working on labeling guidelines and probably wants them out before allowing imports. Michelle M: If you can sue a small farmer for GMO’s accidentally getting in their crop, can I sue you if they are found in my organic child’s body? Monsanto: Hi, Michelle. The truth is, we don’t sue farmers when our seeds end up on their fields unintentionally. We never have, and we never will. Farmers are the heart of our business. That’s why we’ve made a commitment and policy related to this area of concern, and it’s available here on our website. 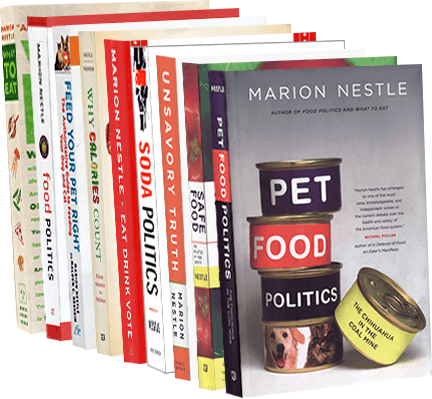 I wrote about the origins of the current politics of GMOs in Safe Food: The Politics of Food Safety. The book first came out in 2003 and in an updated edition in 2010. Not much has changed, alas.